with over 500 stores in Japan. that will provide elegant service. Free changing clothes are available. so please ask us first. Focused mainly on Lymph Drainage which is expected to alleviate swelling or recovering from fatigue. of oil depending on your taste. Stimulating meridian points on palm increases circulation and relieves fatigue and stress. has tension in their arms, shoulders or eyes. of your shoulders, head, neck and ears. according to your feelings or physical condition. which focus on treating specific injuries, repairing damage and rehabilitation. ＊Eligible for health fund rebate. 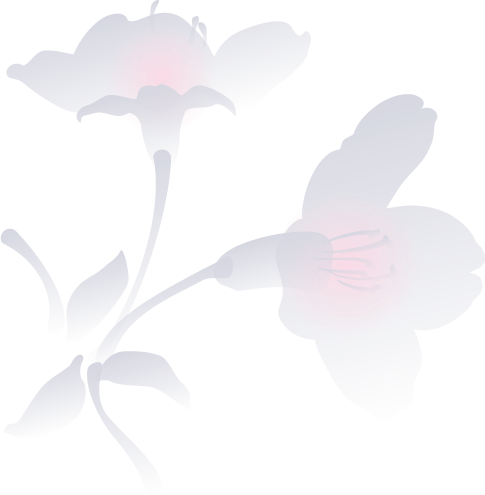 Dear Patrons, We have several conditions for providing Remedial Massage Therapy. 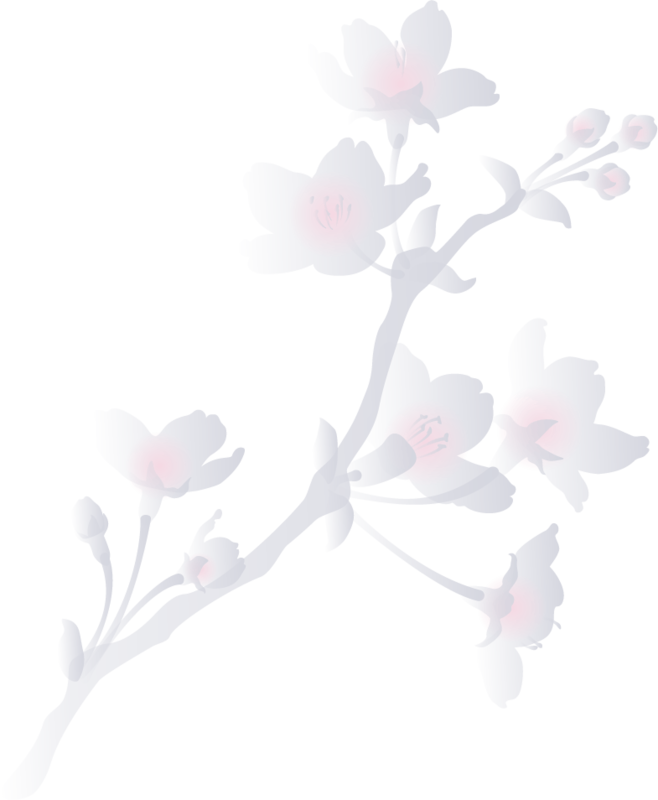 Reserving for Remedial Massage are only available over the phone and the front desk. Only available for in advance booking beforehand. Booking for Remedial must be made at least minimum of 24 hours before the time of booking. All other non-remedial products (Body Care, Aroma etc) are not applicable for health fund rebate. we will automatically cancel the booking. for Health Fund Rebate are Medibank Private and HCF. and provider numbers will be provided. Remedial Massage is available on weekdays only. Only one remedial therapist available on each day. Not available for couples or paired booking. 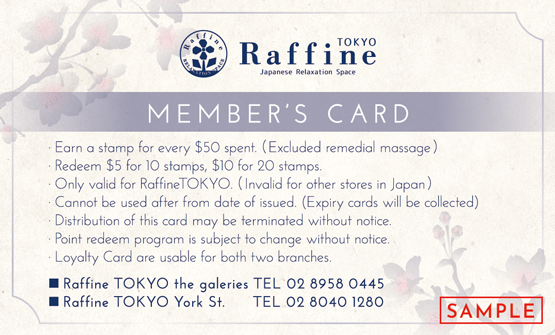 This gift voucher is valid only at Raffine TOKYO. This gift voucher is nonrefundable. This gift voucher is not exchangeable for cash. 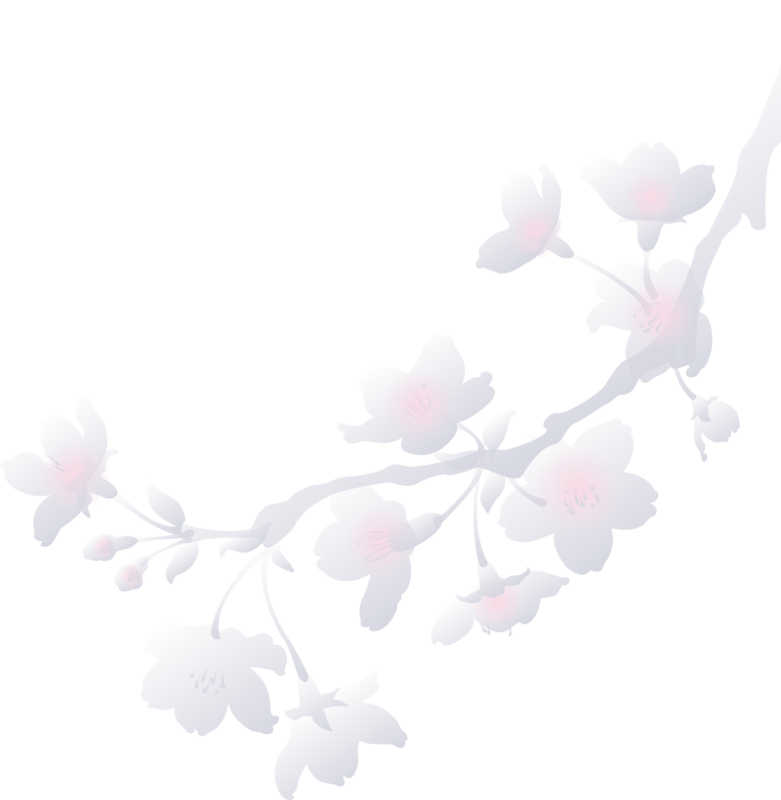 Gift vouchers are not used or redeemable for Remedial Massage. 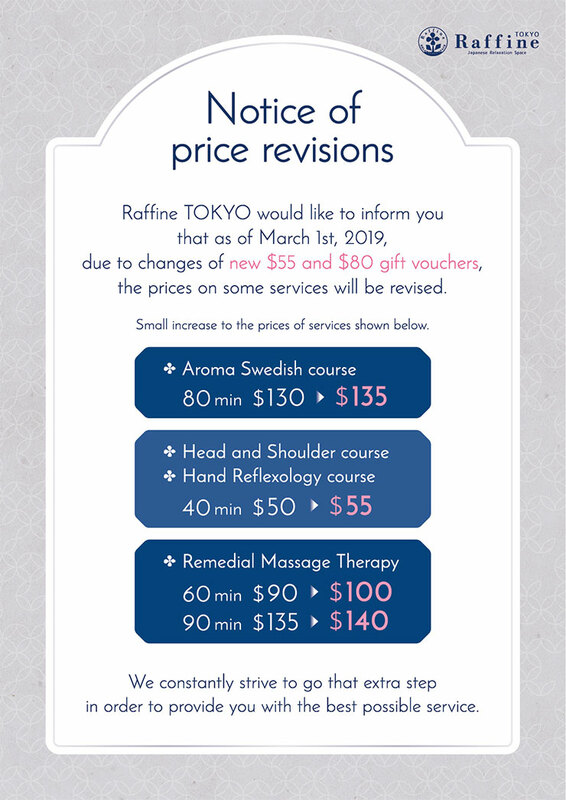 Please present this gift voucher on the day you visit Raffine TOKYO. Special Gift to a Special One. Making payment for services on credit card will also apply for a stamp. Purchasing gift voucher ($50 voucher and $100 voucher) will also count for a stamp. Using gift voucher ($50 voucher and $100 voucher) will not apply for a stamp. Design of the card may change without any notice. Distribution of this card may be terminated without notice. Point redeem program is subject to change without notice. 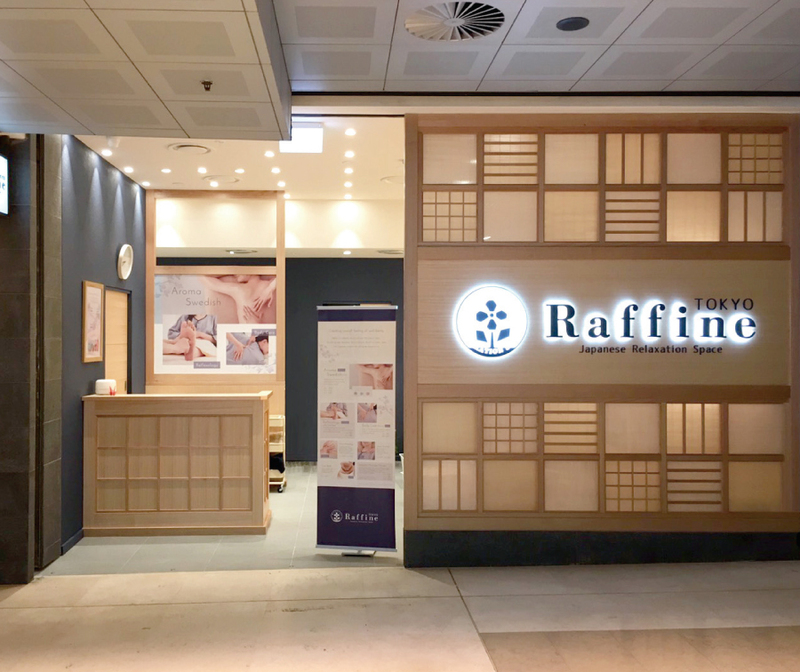 Copyright©Raffine Inc. All Rights Reserved.